In press, available from the Journal of Physical Chemistry A. The INS experiment was carried out using the TOSCA instrument across the pond at the ISIS facility of the Rutherford Appleton Laboratory. The solid-state calculations were performed, as usual, with DMol3 from Accelrys. The paper was presented originally at the 2005 ACS DC meeting, available in the posters page on this site. Another example of theory and vibrational spectroscopy generating a far more complete picture than crystallography alone. Abstract: The inelastic neutron scattering (INS) spectrum of polycrystalline Cs2[B12H12] is assigned through 1200 cm-1 based on aqueous and solid-state Raman/IR measurements and normal mode analyses from solid-state density functional theory. The Cs+ cations are responsible for frequency shifts of the internal cage vibrational modes and Ih cage mode splittings due to the crystal Th site symmetry. These changes to the [B12H12]-2 molecular modes make isolated molecule calculations inadequate for use in complete assignments. Solid-state calculations reveal that 30/40 cm-1 shifts of Tg/Hg molecular modes are responsible for structure in the INS spectrum unobserved by optical methods or in aqueous solutions. 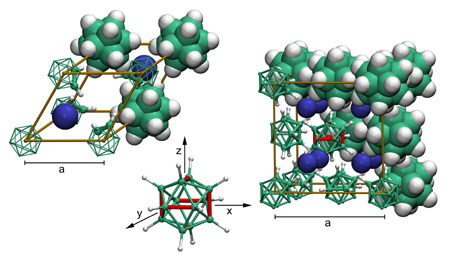 Next PostNext Solid-State DFT Of The THz Spectrum Of HMX Is (In) Science!